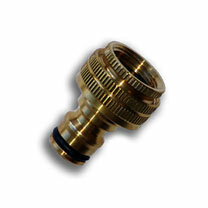 This solid brass connector will last much longer compared to its plastic counterparts! It has a ¾" inlet to connect to a ¾" threaded tap, with a ½" quick connect male outlet, thus converting the tap to a quick connector outlet. It is fully compatible with all recognised plastic and brass snap fit hose fittings.